Vrunda Dhagat, Parul Shah, Rajal Thakar, Kruti Deliwala. Background: With all the modern needs of contraception rising on one side, infertility is still a major challenge to the gynaecological practitioners on other hand. Polycystic ovarian syndrome (PCOS) is the most common cause of anovulatory infertility, being found in âˆ¼75% of cases. PCOS now proves to be a significant factor in female infertility with prevalence of 0.6 to 3.4% in infertile couples. With improving laboratory facilities, sonography and with routine laparoscopic evaluation of infertility, PCOS has shown a remarkable increase of incidence in recent years. Aims & Objective: The diagnosis of PCOS by ultrasonography & investigations like LH, FSH, Prolactin and or Laparoscopy. The evaluation of treatment options like clomiphene citrate, metformin and laparoscopic ovarian drilling. 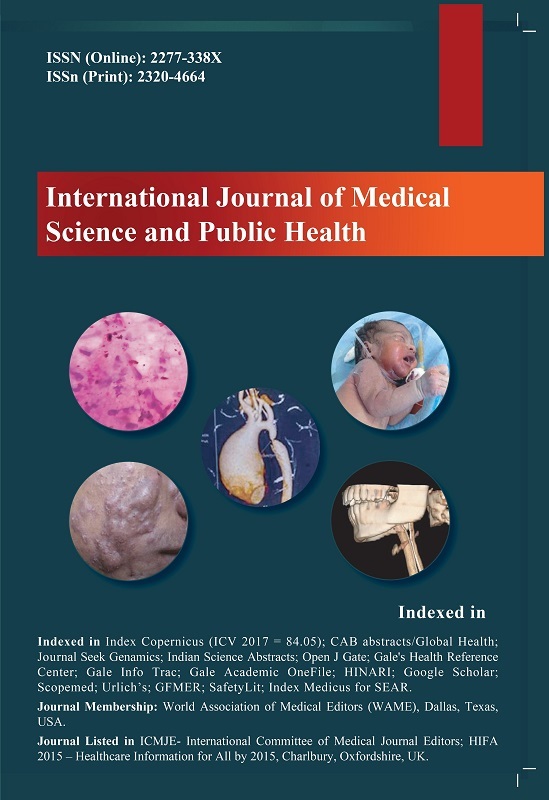 Material and Methods: This is a study of 100 cases of infertility with polycystic ovarian syndrome and its pregnancy outcome. In this study from May 2011 to April 2013,100 cases of Infertility with PCOS were studied at the tertiary care center. Hormonal assay, Ultrasound and laparoscopy were used for diagnosis. Clomiphene citrate, metformin and laparoscopic ovarian drilling were used as treatment modalities. Results: In our study 58% patients were in the age group of 21-25 years and 100% patients complained of infertility among which 60% were of primary type. LH:FSH ratio was more than 1.6 in nearly 82% patients. Among all treatment modalities conception rate with Clomiphene citrate was 40%, with metformin it was 20% and with laparoscopic ovarian drilling followed by C/C it was 65%. Conclusion: PCOS is emerging disease of the new generation found more in young adults being the leading cause of infertility. Apart from diet and exercise changes in lifestyle modification treatment is required in most patients with good conception rate with C/C and laparoscopic ovarian drilling. Key words: Infertility, polycystic ovarian syndrome, metformin, clomiphene citrate, laparoscopic ovarian drilling. 6. Atiomo WU, Pearson S, Shaw S, Dubbins P. Ultrasound criteria in the diagnosis of PCOS. Ultrasound Med Biol 2000;19:41-47. 11. Oh JY, Sung YA, Lee HJ. Clinical implications of menstrual cycle length in oligomenorrhoeic young woman. Clin Enocrinol. 2013;11:44-48. 12. Panidis D, Tziomalos K, Papadakis E, Vosnakis C, Chatzis P. Lifestyle intervention and anti-obesity therapies in the polycystic ovary syndrome: impact on metabolism and fertility. Endocrine. 2013;10:22-25. 13. Roe AH, Dokras A. The Diagnosis of Polycystic Ovary Syndrome in Adolescents. Rev Obstet Gynecol. 2011; 4(2): 45-51. 14. Thessaloniki ESHRE/ASRM-Sponsored PCOS Consensus Workshop Group. The consensus on infertility treatment related with PCOS. Human Reproduct. 2008;23:462-77. 16. Vause TD, Cheung AP, Sierra S, Claman P, Graham J, Guillemin JA, et al. Ovulation induction in PCOS. J Obstet Gynaecol Can. 2010;32(5):495-502. 20. Farquhar C, Brown J, Marjoribanks J. Laparoscopic drilling by diathermy or laser for ovulation induction in PCOS. Cochrane Database Syst Rev. 2007;3:.7-10.